It was just after lunch one day in late September. 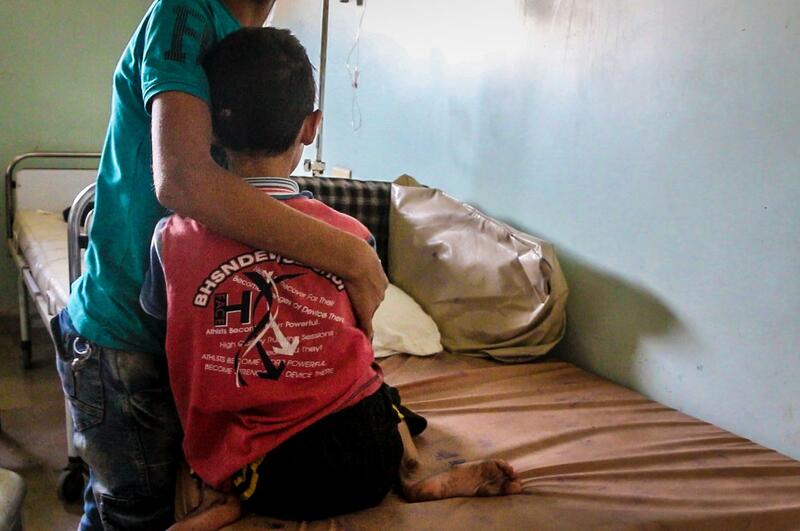 Nine-year-old Abdul Hadi was playing in front of his house in east Aleppo, when a barrel bomb fell from the sky. The boy was knocked unconscious and sustained injuries to his head. Days later, Syrian and Russian forces would step up their bombing campaign on the besieged part of the city. In hospital, he was put straight on to a ventilator. “He was almost dead by the time we reached the hospital but, thanks be to God, he made it,” says his mother. But when he regained consciousness, Abdul Hadi had lost his memory. “His mind has gone blank and he can’t feel anything,” she continued. He can no longer feed himself, so his mother feeds him with a syringe. The damage to Abdul Habdi's skull has brought on convulsions, but a brain scan is out of the question, as no such equipment exists in besieged east Aleppo. Before the siege was imposed last July, patients needing specialised treatment were referred to hospitals elsewhere in northern Syria or else over the border to Turkey. But for the past four months, all roads out of the city have been blocked. Since Syrian and Russian forces have stepped up airstrikes, at least 2,209 people have been wounded, including at least 468 children. The severity of many people’s injuries makes the lack of specialist equipment all the more desperate. Equally devastating is the shortage of specialist medical staff – out of the 35 doctors left in east Aleppo, only seven are surgeons with the skills to operate on the wounded. Medical supplies and drugs are also running out. “We don’t have any medicines for neurological disorders,” says Abu Yazan, while stocks of drugs to treat cancer, tuberculosis and hepatitis are all finished. The government blockade is adding to the difficulties for medical staff in east Aleppo, with all seven still-functioning hospitals experiencing a fuel shortage. To conserve fuel, generators now run for just four hours a day. Abu Yazan says that some equipment, such as oxygen generators, are now out of action as a result. “We are suffering a lot from the shortages,” says Abu Yazan. “There are so many critical patients who need to be transferred out of east Aleppo, but there’s no route out of the city.